If you’re into throwback looks, the Flairstache is one you should consider. Flared sideburns help deliver the retro coolness. As your sideburns become more visible, use your Wahl® trimmer to create a lower border at your desired length by trimming a defined, horizontal line at the bottom. This line should be somewhere between your ear lobes and your chin to achieve the flared appearance. Keep your mustache and Soul Patch and shave your cheeks, chin and neck clean. Your mustache should extend just beyond the outside of your top lip and reach just under your nose. You’ll also want to shave a small gap at the middle of your lip to separate the right side from the left side. If you prefer a blocked shape sideburn, trim an angled line from the top of the sideburn to the wider bottom edge. 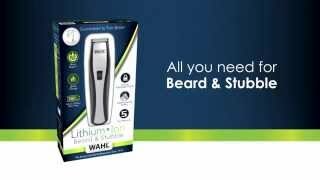 If you would like a swooping curved design, use a Wahl® trimmer to create a sloping line from your ear to the tip of your sideburn that follows the natural upper border of your beard.